PHILADELPHIA (September 12, 2018)—To a packed house on La Salle University’s campus, Felipe Calderón, former president of Mexico, presented his thoughts on the North American Free Trade Agreement, immigration, the drug trade along the U.S.-Mexican border, weapons, and healthcare services. Facilitating the discussion were associate professors of political science Michael Boyle and Miguel Glatzer, and Emily Dabas, a sophomore international relations student who also serves as president of La Salle’s Organization of Latin American Students. 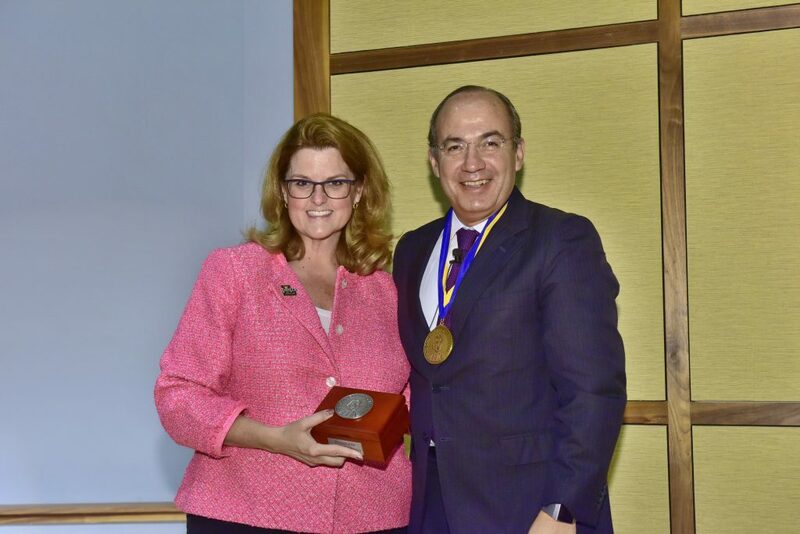 Prior to the discussion, La Salle University President Colleen M. Hanycz, Ph.D., presented President Calderón with the Brother Teliow Fackeldey, FSC Presidential Medal. One of the University’s highest and distinctive honors, it is given to individuals who have distinguished themselves professionally, socially, or civically in the guiding mission and principles of La Salle. President Calderón came to La Salle via the University of Pennsylvania’s Perry World House, where he was recently announced as a 2018-2019 fellow.